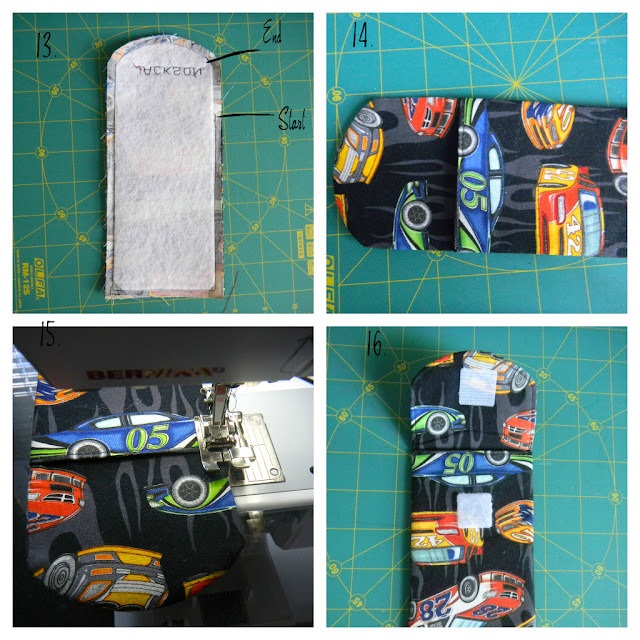 Per the request of my grandson whom I will bend over backwards for I made a case for his IPod. He chose this car fabric and YES I know it is upside down!!! Sometimes directional fabric does not like me as much as I like it too. I chalked it up to "senior moment" which seem to occur more than I would like. Normally I would start over and redo but I told myself Jackson probably won't even notice or care. Anyways......It will do the job! I just recently bought Wonder Clips through Amazon and thought this would be a great project to test them out. 1. 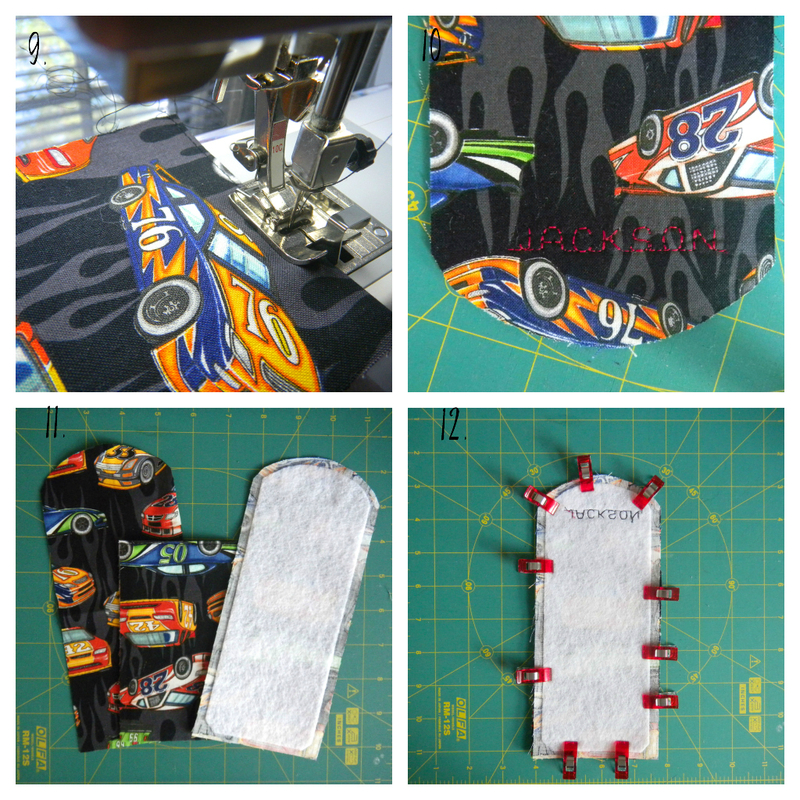 FABRIC- Cut 1- 11 1/2" x 3 3/4" and Cut 2 - 8 1/2"x 3 3/4"
FLEECE- Cut 1 -5 1/2" x 3 1/4" and Cut 1 - 8" x 3 1/4"
2. On the 2 pieces of 8 1/2" x 3 3/4 use a bowl to make to make the curved top. 5. This is what you should have cut out. 6. Fold the 11 1/2" x 3 3/4" piece in half making a crease for the half way mark. Open up fabric and take your 5 1/2" x 3 1/4" Fleece and iron on to fabric leaving a 1/4" seam allowance on the sides and bottom. 7. Take your 8" x 3 1/4" Fleece, trim curved top leaving 1/4" seam allowance and iron on. 8. I clipped the corners of the fleece at the bottom so there is not a lot of excess in the corners. 9. Fold in half the 11 1/2" x 3 3/4" piece and top stitch on the fold. 10. Optional - I had my machine embroider Jacksons name on the flap. 11. Sandwich pieces together in this order. 1st curved piece right side up - pocket - 2nd curved fleece piece right side down. 12. Pin pieces together. I used my Wonder Clips and I love them! The pieces stay together nice and flat without bunching when you have multiple layers that are thicker. I just removed as I went along the seam allowance. 13. Sew pieces together with a 1/4 inch seam allowance, leaving an opening to turn right side out. See Example. 14. Turn right side out. Turning tools help a lot especially along the seams and corners. 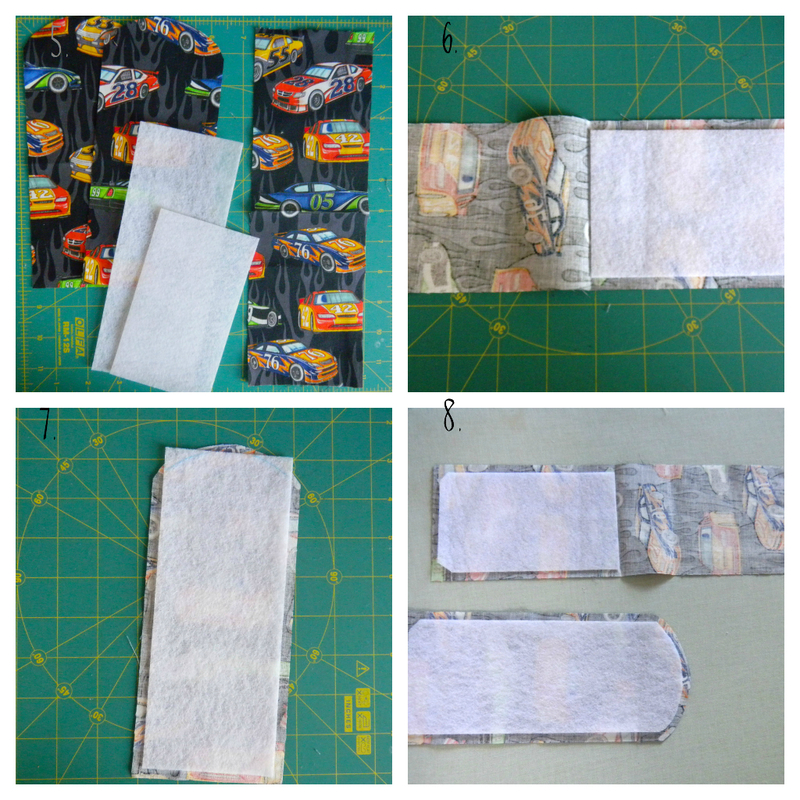 Fold in seam allowance on opening and use Fabric-Tac to hold together. Press. 15. Starting just at the top of the pocket top stitch along the flap and end at the top of the pocket on the opposite side. 16. Add velcro. 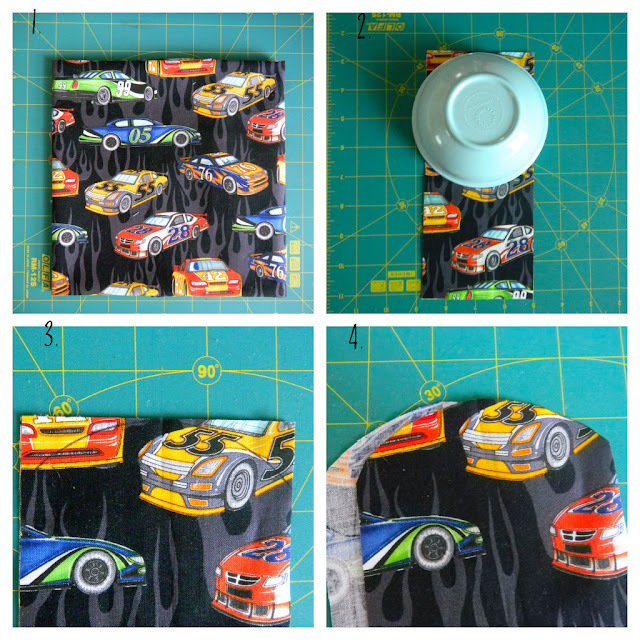 Put a little Fabric-Tac on each piece for added strength. What a neat idea! I may have to try that! New Follower...thru the 300 bloggers or less blog hop! I am a new Follower. Found you through 300 bloggers blog hop! I am sure your grandson loved this, Paula! Thanks for sharing. I will be sharing this via Pinterest. I can't wait to see what you'll share this week! Have a fun weekend!